Wasps secured a third consecutive appearance in the Premiership final after a stirring second half display. The London side fired 26 unanswered points after the interval to book a final appointment against Leicester at Twickenham next Saturday. Tom Rees, Josh Lewsey, Ayoola Erinle and Simon Shaw crossed as Wasps edged the try-count 4-3. Sale led 22-17 at the break with tries from Sebastien Chabal, Jason White and Mark Cueto before Wasps hit back. A fluctuating opening period saw Sale build a five point lead that would have been more had a Jason Robinson try not been disallowed after a clash involving Matt Dawson. But Wasps shook themselves from their slumber after the interval and Erinle crashed over after a powerful maul to put them in command. Alex King then produced some intricate play to weave through and set up Shaw for a simple, clinching try. Wasps coach Warren Gatland insisted the Premiership final against Leicester at Twickenham next Saturday will be an occasion to savour. "Everyone was hoping for a this final and it's the right one. We're two powerful clubs who have dominated rugby for seven seasons," said Gatland. "Hopefully there will be a big demand for tickets, the weather will be good and there will be plenty of tries. "With so many people leaving or retiring, it promises to be an emotional day." Sale coach Kingsley Jones was pleased with the Sharks' performance but felt they fell foul of the referee's whistle. "We were always a threat and when we had the ball we made them defend, but we just didn't get the ball in the second half," he said. "I can't question our spirit. We worked hard and scrapped it out. But we were hard done by on the 50-50 decisions. "It was also frustrating not to get rewarded for dominating at the scrum." 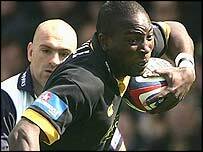 Wasps: Van Gisbergen; Sackey, Erinle, Lewsey, Voyce; King, Dawson; Payne, Greening, Green; Shaw, Birkett; Worsley, Rees, Dallaglio. Replacements: Leota, Dowd, Hart, Purdy, Fury, Brooks, Mbu. Sale: Robinson, Cueto, Baxendell, Todd, Hanley; Hodgson, Redpath; Coutts, Titterrell, Stewart, Schofield, White, C Jones, Lund, Chabal. Replacements (from): Bruno, Turner, Lobbe, Carter, Anglesea, C R Jones, Wigglesworth, Hercus, Martens, Ripol.